Light Efficient Design UK explains how it helped LED lighting pass the test at MOT repairs specialist, Bartletts Motor Technicians. 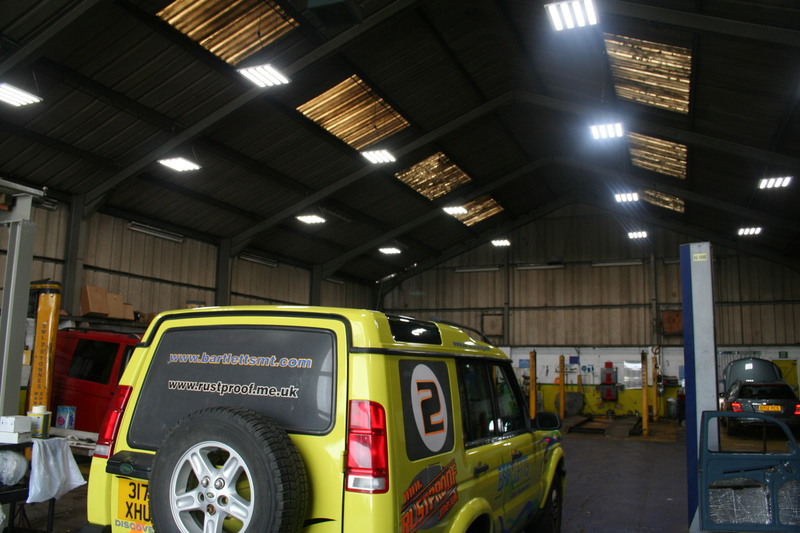 Following poor quality corn lamps putting a spanner in the works, Weymouth-based Bartletts Motor Technicians has enhanced its garage workshop with high-quality LED retrofit lighting solutions from Light Efficient Design UK Limited. Bartlett’s needed to replace their existing 120W LED corn lamps, which had been installed two years ago to replace 400W HID high-bays. Unfortunately, many of the corn lamp LEDs had quickly failed completely or partially, leaving the firm with poorer lighting than before. Following a product demonstration, 21 Light Efficient Design UK LED-9150-50k 150W retrofit panels were chosen. As testimony to their ease of use, Bartletts’ technicians successfully installed the LED panels themselves. The retrofit daylight LED high-bay luminaires deliver a light output of 18,780lm at a colour temperature of 5,000K. Each lighting panel measures 600mm x 600mm and includes four LED strips and diffusers. The product is ideal for lighting large industrial spaces and the five-year guarantee ensures far longer lifespan compared to standard HIDs while also significantly improving energy efficiency. With a 50,000 hour-rated lamp life, all Light Efficient Design products are backed by a five-year warranty, are CE/ROHS certified and are approved for use in enclosed fittings, unlike most other LED retrofit lamps on the market today. The Light Efficient Design Newbury warehouse offers prompt delivery to UK and Irish electrical wholesalers on all Light Efficient Design retrofit LED products.